A movie based on the life and wartime career of Günther Prien, U-47 - Kapitänleutnant Prien, directed by Harald Reinl and starring Dieter Eppler in the lead role, was released by ARCA Film Produktion GmbH in Germany in 1958. While being loosely based on the life of the commander of U-47 and his crew, it has a few injections of fiction to complete the plot. Nevertheless, the movie sticks close to reality when describing the life of a submariner and what it was like fighting the war from the depths of the North Atlantic. Posters for the film "U-47 - Kapitänleutnant Prien. Left to Right: i. Official film poster. ii. Another original poster, with an image of Dieter Eppler as Kapitänleutnant Prien. iii. The cover of the box of video version of the film, available from the bookstore through amazon.de. In the film, Prien's wife Ingeborg (Sabina Sesselmann) asks him to leave active duty and stay ashore, but as he is the archetypal "last try hero" so beloved of the silver screen, Prien volunteers for one last mission - the attack on Scapa Flow. Taking us back again to fact, Prien scrutinises the plans, sets off for the Orkneys, sinks the enemy battleship and makes it out in one piece, arriving home to a hero's welcome. Back home, an old friend of Prien, a pastor, Pfarrer Kille (played by Dieter Borsche and possibly modelled on the character of Martin Niemöller, himself a former U-boat ace) tries to persuade our hero to give up the ways of warfare, but the eternal soldier Prien resists, preferring instead to return to the heat of battle and the life he knows best. The character here switches from war-hero to the iconic image of post-war Germany - remembering the words of his friend, he sets about helping those being hunted by the Nazi government. Likewise, our hero does not make it out of the film alive, for on his final mission he is killed, after finally promising his wife that it would be his last combat venture. The idea of a popular game named after a famous person - Brian Lara's Test Cricket, Daley Thompson's Decathlon and the like - is not a new phenomenon. In Germany during the war, the celebrities of the day were not sportsmen and women or popular musicians as is the case today, but famous tank commanders, pilots and Kriegsmarine aces. Along with the photographs and cigarette cards, here were a number of board games for children manufactured all over Europe, and Germany was no different in this regard. One of the most famous games was centred on Günther Prien, and specifically his successful mission to Scapa Flow which had captured the public imagination. Called Mit "Prien" gegen England ('with "Prien" against England'), players put themselves in the position of the famous skipper of U-47, where they had to plot their path across the board to their mission objective while trying to negotiate a number of hazards and avoid numerous threats and attacks. It was a very simple game, and very similar to Snakes and Ladders where players used metal pieces representing submarines. 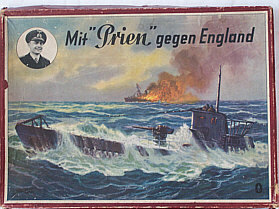 Images of the wartime board game, Mit "Prien" gegen England. The objective was to get your U-boat to Scapa Flow and accomplish your mission, negotiating a number of hazards on the way. The image to the left provides an illustration of the box, while the other two show the game board and a close up of the small painted metal submarine pieces. This game, and a number of others like it, made the news in the summer of 2007 when they were put up for auction: rather unsurprisingly, this story generated plenty of hysterical anti-German ramblings from the popular press, which used the existence of these games as a springboard for yet another excuse to have a go at the dastardly little German children who were playing these aggressive war games while their British counterparts were playing tiddlywinks and hopscotch. You can read an article from the Daily Mail, along with a perhaps more sober assessment of the game-playing activities of kids during the War. German children played with 'Bombers over England' boardgames during WWII. Daily Mail, 20th August 2007. War games: tabloid edition. From the Blog Airminded: Airpower and British society, 1908-1941. After his untimely death at sea in March 1941, a street in the Austrian border town of Braunau-am-Inn - Nazi leader Adolf Hitler's place of birth - was named after Günther Prien. Günther Prien-Strasse was located in the district of Braunau-Laab, and was renamed after the war to Adolf Wenger-Strasse. A neighbouring street, now called Franz Stelzhamer-Strasse, was also named after another famed U-47 crewman, Prien's first watch officer Engelbert Endrass, who later went on to command both U-46 and the Type VIIC U-567 before his death on 21 December 1941.